Non-governmental organizations (NGOs) are high profile actors in the field of international development, both as providers of services to vulnerable individuals and communities and as campaigning policy advocates. This book provides a critical introduction to the wide-ranging topic of NGOs and development. Written by two authors with more than twenty years experience of research and practice in the field, the book combines a critical overview of the main research literature with a set of up-to-date theoretical and practical insights drawn from experience in Asia, Europe, Africa and elsewhere. It highlights the importance of NGOs in development, but it also engages fully with the criticisms that the increased profile of NGOs in development now attracts. Non-Governmental Organizations and Development begins with a discussion of the wide diversity of NGOs and their roles, and locates their recent rise to prominence within broader histories of struggle as well as within the ideological context of neo-liberalism. It then moves on to analyze how interest in NGOs has both reflected and informed wider theoretical trends and debates within development studies, before analyzing NGOs and their practices, using a broad range of short case studies of successful and unsuccessful interventions. 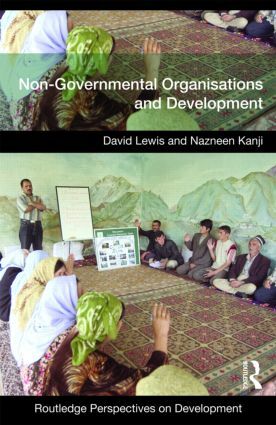 David Lewis and Nazneen Kanji then moves on to describe the ways in which NGOs are increasingly important in relation to ideas and debates about ‘civil society’, globalization and the changing ideas and practices of international aid. The book argues that NGOs are now central to development theory and practice and are likely to remain important actors in development in the years to come. In order to appreciate the issues raised by their increasing diversity and complexity, the authors conclude that it is necessary to deploy a historically and theoretically informed perspective. This critical overview will be useful to students of development studies at undergraduate and masters levels, as well as to more general readers and practitioners. The format of the book includes figures, photographs and case studies as well as reader material in the form of summary points and questions. Despite the growing importance of the topic, no single short, up-to-date book exists that sets out the main issues in the form of a clearly written, academically-informed text: until now. Introduction: What are non-governmental organizations? NGOs and development: From alternative to mainstream?